The battle for market supremacy on the luxury sedan segment continues this year as well, and BMW is no stranger to competition. The Bavarian automaker worked diligently on bringing even more luxury and improvements to their 2013 BMW 7-Series, and I'm pretty sure they won't disappoint. The new 7-Series comes with a wide range of powertrains, varying from 258 to 544 horsepower. 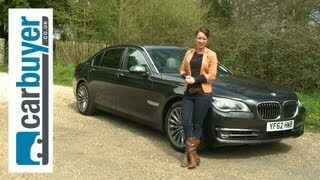 The entry level is the BMW 730d able to develop 258 horsepower and 412 lb-ft of torque. Top speed is electronically limited at 155 miles per hour regardless of the engine variant, so we'd better have a look at the acceleration and fuel consumption in order to see a difference. The 730d goes from 0 to 62 mph in 6.1 seconds and can cover 50.4 miles to the gallon (combined). Next in line is the 740d developing 313 horsepower and 464 lb-ft of torque. 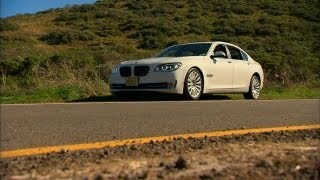 Acceleration is rated at 5.5 seconds from 0 to 62 mph and as far as fuel efficiency goes, the 740d can cover 49.6 mpg. The 740i differs slightly from its counterpart and develops 320 horsepower, 331 lb-ft of torque, an acceleration from 0 to 62 in 5.7 seconds and fuel consumption of 35.8 mpg. 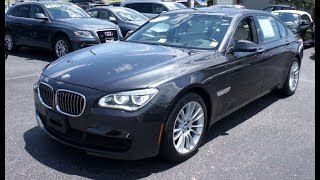 The 750i develops 449 horsepower and 480 lb-ft of torque; it goes from 0 to 62 mph in just 4.8 seconds and can cover 32.8 mpg combined. Last but not least the most powerful engine, the 760Li long-wheelbase model delivers 544 horsepower, 553 lb-ft of torque, will reach 62 mph from a standstill in 4.6 seconds and yields a fuel efficiency of 21.1 mpg combined. 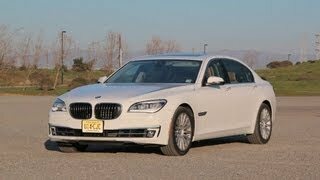 On the exterior the 2013 7-Series differs from the previous model but it's nothing too excessive. The shape remains familiar but the attention to details has been increased and those who possess this trait will definitely notice the changes brought to the new model. Inside the new 7-Series the offers new redesigned seats built to deliver a higher degree of comfort on long-distance drives, a better Active Cruise Control system enhanced by a front-fitted camera, a faster and improved navigation system with 3D graphics higher performances and new features such as the ability to send e-mails using voice recognition software. Optional extras for the new 7-Series include a brand new Bang & Olufsen audio system including 16 speakers, Ivory White and Veneto Beige Dakota and Nappa leather and rear-seat entertainment package that includes two 9.2 inch screens, just to name a few. Prices for the BMW 7-Series 2013 vary from model to model, the 730d being offered at the price of £58,115 ($91,153 at today's conversion rate) whereas the top of the line 750Li and 760Li models having a price-tag of £71,340 ($111,882) and £101,805 ($159,640) respectively. Its key competitors remain the same, those being the Mercedes-Benz S-Class, the Jaguar XJ and the Audi A8.